Entertainment engineering specialist WIcreations specified and fabricated two large pieces – a water fountain and a Tree of Life - for the Opening and Closing Ceremonies of the 4th Islamic Solidarity Games, a multi-national, multi-sport event staged in Baku, Azerbaijan from 12 to 22 May 2017. WI’s team, managed by Yves Vervloet, was working for Betty Productions, who co-ordinated all the creative and technical production elements for the ceremonies on behalf of the Islamic Games Operations Committee. The ceremonies both took place in the 70,000 seater Baku National Stadium, a venue already familiar to the WI team after their work there for the 2015 European Games. 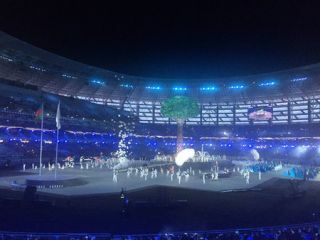 The Games were officially opened by Azerbaijani President Ilham Aliyev amidst an array of dancers, musicians, fireworks, horses, camels and donkeys. The teams of the 2800 athletes were led onto the field-of-play by women carrying water collected from around Azerbaijan, which was poured into the massive bowl. The base was constructed from a 200 mm high rigid steel frame with custom steel-flanged castors, which alone weighed 1.7 tonnes. It was designed to take 15 tonnes of water in tanks below and still be manually movable via a pair of 30 metre steel track beams that were integral to the stage structure. The tracks were built to WI’s spec by Stage One Technologies, who constructed and delivered the stage. Each piece was then sprayed with a 4 mm Polyurea hot spray coating (as used in swimming pools). The heavy viscosity of the hot spray gave the authentic rounded hammered look on the outside and a smooth interior surface. “The result was absolutely perfect,” said Yves with some satisfaction. Inside the vessel were 24 pumps. Sixteen created the small perimeter sprays of water, one dealt with the central jet effect, eight made the swirl effect, with one empty pump as contingency for backup. All the pumps were DMX controlled via a single channel and programmed and run from a ChamSys console. It was pushed into show position – via the 30m tracks – manually by the stage crew. Once located, three hatches opened in the stage to allow the crew to hook up the water FX pumps and the two hoses to commence the water filling via 7 x Harting connectors. For the Closing Ceremony, the stage set was laid out in a grid referencing the geometric designs and precision that are characteristic of Islamic art and found in traditional Azerbaijan carpets. The water bowl was used again and right beside it, centre stage, was a 27 metre tall Tree of Life. In the second shift, the WI team built the roots, trunk and the water vessel and then oversaw the most challenging aspect of the tree build – the crane lift of the 8 tonne top section (upper crown) complete with leaves. The OC and CC were created by Betty Productions – led by director and executive producer, Catherine Ugwu and artistic director Nathan M. Wright. The production designer was Thanassis Demiris, lighting was designed by Adam Bassett and the visual content director was Richard Lindsay.